Introduction: Gestational diabetes mellitus (GDM) is state of carbohydrate intolerance detected first time during pregnancy. GDM represents a significant risk factor for the development of CVD in women. The degree to which women with histories of gestational diabetes are at risk for cardiovascular disease, beyond their predisposition to future diabetes, is still unclear. The aim of our study was to assess the presence of surrogate markers of subclinical atherosclerosis which can be present in them even without developing type 2 diabetes. Subjects and Methods: In this descriptive cross-sectional hospital based study, 50 patients 20-45 yrs of age, premenopausal, at least 1 yr past her most recent pregnancy, and not more than 5 yr past her index pregnancy with GDM. These patients and controls who did not have GDM were assessed for carotid intima media thickness,endothelial dysfunction, epicardial fat thickness and other cardiovascular risk factors. Results: Women with pGDM were found to have unfavourable cardiovascular risk parameters. They also demonstrated more frequent occurrence of metabolic syndrome(64% vs 10%) than control subjects. Individual components of MS increased with increasing BMI in both the groups. As far as markers of subclinical atherosclerosis were concerned women with pGDM had significantly higher CIMT, FMD and epicardial fat thickness than control group. Conclusion: Women with pGDM, even before development of diabetes have significant differences in CVD risk factors when compared to those who do not have such history. Postpartum screening for glucose intolerance and efforts to minimize modifiable cardiovascular risk factors, including hypertension, viscerall adiposity, and dyslipidemia should be the most effective measures for lowering of cardiovascular risk. Type 2 diabetes is a known risk factor for cardiovascular disease (CVD), and insulin resistance has been implicated in this association. Besides the increased risk of carbohydrate metabolism disturbances, this population has an increased cardiovascular risk due to clustering of other cardiovascular risk factors such as increased prevalence of metabolic syndrome (MS). , The degree to which women with histories of gestational diabetes (GD) are at risk for CVD, beyond their predisposition to future diabetes, is still unclear. In recent times, certain surrogate markers of atherosclerosis have been devised, which can help to assess the cardiovascular risk noninvasively. Assessment of carotid intima media thickness (CIMT)  and endothelial dysfunction  are considered as a potential tool for predicting coronary atherosclerosis and future cardiovascular events. Obesity and MS are major public health concerns not only in our country but across the globe. In parallel with type 2 diabetes pandemic, the incidence of GDM has risen rapidly. GDM has been found to occur in 12-21% of Indian women. , Since we expect to see greater metabolic dysfunction in women with histories of GD, this may represent a greater opportunity for prevention of future glucose intolerance and related cardio metabolic dysfunction in this high-risk subset of patients. The aim of our study was to assess the presence of surrogate markers of subclinical atherosclerosis in GDM even without developing type 2 diabetes. In this descriptive cross-sectional hospital-based study, the study participants were recruited from obstetrics and gynecology clinics, endocrine clinic and associated urban center of Era's Lucknow Medical College Hospital between January 2011 and December 2013. Exclusion criteria included diagnosis of diabetes mellitus or hypertension antedating pregnancy or after pregnancy, use of medications (including oral contraceptive pills), and tobacco use of vasodilators, antilipidemic, history of preeclampsia or eclampsia in each of their pregnancies, current pregnancy and also those who had an inflammatory rheumatoid vasculitis or chronic liver/kidney disease such as rheumatic or chronic infectious disease. Fasting plasma glucose >100 mg/dl (5.6 mmol/L). Insulin resistance was measured by Homeostasis model assessment method and was calculated by the formula: Fasting serum insulin (μ units/ml) × fasting serum glucose (mmole/l)/22.5. Endothelial function was measured noninvasively by ultrasonographic assessment of right brachial artery dimensions. The diameter of the right brachial was measured twice, first at rest then after inducing reactive hyperemia with the help of the pneumatic cuff. It was carried out by a blinded sonologist after an overnight fast in a cool, quiet room with B mode ultrasound scanner (Siemens, Germany) using 10 MHz linear transducer. The diameter of right brachial artery was measured 2-8 cm above the antecubital space in the end diastolic phase from one media-adventitia interface to the other at the clearest part 3 times and the average was taken. After the detection of the right transducer position, skin was marked, and arm kept in the same position. The blood pressure cuff was tied on the upper arm and inflated to supra systolic levels kept inflated for 4 min. Totally, 60 s after the cuff was released, brachial artery dimensions were again measured. The maximum diameter measurement was defined as the average of three consecutive diameters measurements. FMD was calculated as the percent increase in vascular diameter from the difference between the maximum and baseline brachial artery diameter. A GE Health Care Vivid 7 Dimension (Wauwatosa, WI, USA) high-resolution ultrasound scanner with a high frequency (10-12 MHZ) linear array transducer was used for CIMT measurement. The common carotid arteries were scanned at the level of bifurcation on either side, and the mean value was used for analysis. The intima media thickness was measured in the far wall of the arteries at sites identified as diffuse and continuous projections with the greatest distance between the luminal intimal interface and media adventitial interface but without atherosclerotic plaques. Localized lesions >2 mm thickness were considered to be atherosclerotic plaques. CIMT was assessed by single observer who was blinded for the diagnosis. Each subject underwent transthoracic two-dimensional guided M-mode echocardiography. Standard parasternal and apical views were obtained in the left lateral decubitus position. Epicardial fat was identified as echocardiographic free space between the outer wall of the myocardium and the visceral layer of the pericardium. Epicardial fat thickness (EFT) was measured perpendicularly on the free wall of the right ventricle at the end of diastole in three cardiac cycles. The average value of three cardiac cycles from each echocardiographic view was considered. The study included 50 women with the previous history of GD and 50 years age, and BMI matched controls. The baseline characteristics of the women with pGDM and control subjects have been presented in [Table 1]. The mean age of participants was 34.6 ± 5.6 and 34.0 ± 6.4 years in the two groups. The control subjects and women with pGDM were not significantly different in BMI, gravid status and number of years postpartum. However, family history of type 2 diabetes was significantly higher (50% vs. 14%, P = 0.02) in women with pGDM than the control subjects. In general, women with pGDM were found to have unfavorable cardiovascular risk parameters [Table 2]. Prevalence of impaired glucose tolerance was higher in women with pGDM. Women with pGDM had higher fasting insulin levels, diastolic blood pressures, uric acid levels and worse lipid profile than control subjects. They also demonstrated more frequent occurrence of MS (64% vs. 10%) as well than control subjects. Individual components of MS increased with increasing BMI in both the groups. As far as markers of subclinical atherosclerosis were concerned [Table 3], women with pGDM had significantly higher CIMT, FMD and EFT than the control group. Women with pGDM had significantly higher mean CIMT levels 0.84 ± 0.12 mm in women with pGDM versus 0.62 ± 0.08, P = 0.02 mm in women without histories of pGDM (P = 0.02). CIMT was significantly correlated with age, hypertension, hypertriglyceridemia and insulin resistance and presence of MS [Table 4]. Baseline brachial artery diameter was 3.56 ± 0.62 in women with pGDM and 3.6 ± 0.5 in controls (P = 0.18). FMD was lower in women with pGDM than in controls (6% vs. 15%, P = 0.03). FMD had a significant correlation with insulin resistance, hypertriglyceridemia hypertension and presence of MS.
Epicardial fat thickness was 6.0 ± 1.5 mm in women with pGDM and 3.42 ± 1.0 mm, in control group. P = 0.001), which was significantly higher in women with pGDM and was significantly correlated with WC, insulin resistance and presence of MS. In multivariate regression analysis, only presence of MS and previous history of GD were independent predictors of CIMT, FMD and EFT. Women with histories of GD are at increased risk of developing type 2 diabetes, MS, and CVD. ,,, In a cross-sectional analysis of GENNID, Carr et al. found that women with histories of GD were more likely to have MS and to experience cardiovascular events than women without histories of GD, and moreover that these cardiovascular events occurred at a younger age. It has also been suggested that despite normal glucose levels, women with histories of GD have less favorable cardiovascular risk profile compared to unaffected women. We intended to assess certain surrogate noninvasive markers of atherosclerosis in young premenopausal women as there is a paucity of this data in our population that is ethnically at high risk for GD. Our study has tried to address this issue whether these noninvasive markers of subclinical atherosclerosis are present in this high-risk group of our population before developing type 2 diabetes. 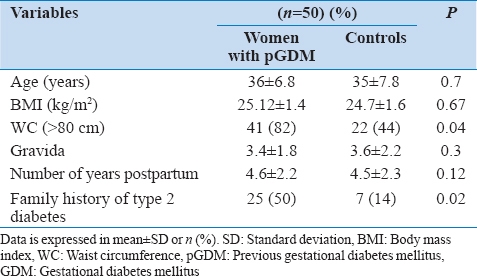 We measured CIMT, FMD and EFT in women with pGDM within 5 years of index pregnancy with GD. In our study, women with pGDM were more common to have family history of type 2 diabetes and had a higher prevalence of MS as a whole along with its individual components. The severity of endothelial dysfunction has been associated with the risk for an initial or recurrent cardiovascular event. We observed that normoglycemic women with pGDM have increased insulin resistance and decreased endothelium-dependent vasodilatation when compared with women without pGDM. Carotid intima media thickness a marker of subclinical atherosclerosis and is commonly used as a surrogate of vascular disease morbidity and mortality was observed to be significantly higher in women with pGDM in our study in concordance with the Freire et al. who also concluded that previous GD was independently associated with increased CIMT, similarly to MS. Tarim et al. studied 30 women with GDM and 40 normoglycemic women of similar age and BMI in the second trimester of pregnancy. They observed that CIMT was significantly greater among the women with GDM compared with that among the non-GDM independent of fasting glucose, high-density lipoprotein and total cholesterol. Volpe et al. studied 28 women with GDM and 24 women without a history of GDM 2 years after delivery and reported that these women had higher mean common CIMT, and that levels of oxidized low-density lipoprotein were independently associated with CIMT, thus suggesting an inflammatory component associated with the altered CIMT. Similarly, Bo et al. reported that CIMT is significantly associated with pGDM and coupled to a higher prevalence of inflammatory markers. We did not include any inflammatory markers in our study and used only imaging strategies to find the presence of silent atherosclerosis. We found that women with pGDM had increased WC, hypertension, adverse lipid profile and higher prevalence of MS. Presence of MS and history of pGDM were independent predictors of all markers of atherosclerosis. The limitations of our study are its cross-sectional design so cause-effect relationship could not be proved and small sample size. We could not perform any subgroup analysis of the effect of duration after index pregnancy on different risk markers. Longer-term studies with larger sample size are necessary to verify whether history of GDM would represent a marker of future increased cardiovascular morbidity and define the role of lifestyle and pharmacological interventions in these subjects. Gestational diabetes mellitus represents a significant risk factor for the development of CVD in women. Women with pGDM, even before the development of diabetes have significant differences in CVD risk factors when compared to those who do not have such history. These women are the candidates who should be given counseling and appropriate advice on lifestyle, in order to decrease their risk for CVD and type 2 diabetes. Postpartum screening for glucose intolerance and efforts to minimize modifiable CVD risk factors, including blood pressure, abdominal adiposity, and dyslipidemia should be strengthened. American Diabetes Association. Diagnosis and classification of diabetes mellitus. Diabetes Care 2011;34 Suppl 1:S62-9. Cheung NW, Byth K. Population health significance of gestational diabetes. Diabetes Care 2003;26:2005-9. Fox CS. Cardiovascular disease risk factors, type 2 diabetes mellitus, and the Framingham heart study. Trends Cardiovasc Med 2010;20:90-5. Lauenborg J, Mathiesen E, Hansen T, Glümer C, Jørgensen T, Borch-Johnsen K, et al. 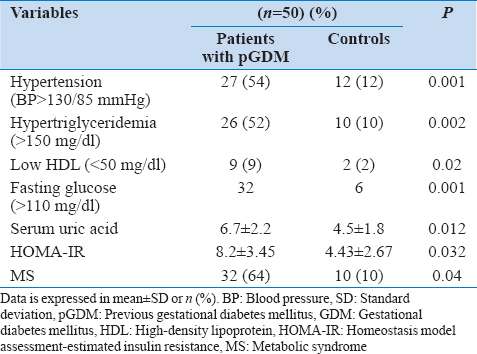 The prevalence of the metabolic syndrome in a Danish population of women with previous gestational diabetes mellitus is three-fold higher than in the general population. J Clin Endocrinol Metab 2005;90:4004-10. Carr DB, Utzschneider KM, Hull RL, Tong J, Wallace TM, Kodama K, et al. Gestational diabetes mellitus increases the risk of cardiovascular disease in women with a family history of type 2 diabetes. Diabetes Care 2006;29:2078-83. O'Leary DH, Polak JF. Intima-media thickness: A tool for atherosclerosis imaging and event prediction. Am J Cardiol 2002;90:18-21. Verma S, Buchanan MR, Anderson TJ. Endothelial function testing as a biomarker of vascular disease. Circulation 2003;108:2054-9. Polak JF, Pencina MJ, Pencina KM, O'Donnell CJ, Wolf PA, D'Agostino RB Sr. Carotid-wall intima-media thickness and cardiovascular events. N Engl J Med 2011;365:213-21. Iacobellis G, Assael F, Ribaudo MC, Zappaterreno A, Alessi G, Di Mario U, et al. Epicardial fat from echocardiography: A new method for visceral adipose tissue prediction. Obes Res 2003;11:304-10. Chaowalit N, Somers VK, Pellikka PA, Rihal CS, Lopez-Jimenez F. Subepicardial adipose tissue and the presence and severity of coronary artery disease. Atherosclerosis 2006;186:354-9. Jones LE, Clarke W, Carney CP. Receipt of diabetes services by insured adults with and without claims for mental disorders. Med Care 2004;42:1167-75. Carpenter MW, Coustan DR. Criteria for screening tests for gestational diabetes. Am J Obstet Gynecol 1982;144:768-73. Knock GA, McCarthy AL, Lowy C, Poston L. Association of gestational diabetes with abnormal maternal vascular endothelial function. Br J Obstet Gynaecol 1997;104:229-34. Paradisi G, Biaggi A, Ferrazzani S, De Carolis S, Caruso A. Abnormal carbohydrate metabolism during pregnancy: Association with endothelial dysfunction. Diabetes Care 2002;25:560-4. Hu J, Norman M, Wallensteen M, Gennser G. Increased large arterial stiffness and impaired acetylcholine induced skin vasodilatation in women with previous gestational diabetes mellitus. Br J Obstet Gynaecol 1998;105:1279-87. Heitritter SM, Solomon CG, Mitchell GF, Skali-Ounis N, Seely EW. Subclinical inflammation and vascular dysfunction in women with previous gestational diabetes mellitus. J Clin Endocrinol Metab 2005;90:3983-8. Fakhrzadeh H, Alatab S, Sharifi F, Mirarefein M, Badamchizadeh Z, Ghaderpanahi M, et al. Carotid intima media thickness, brachial flow mediated dilation and previous history of gestational diabetes mellitus. J Obstet Gynaecol Res 2012;38:1057-63. Anastasiou E, Lekakis JP, Alevizaki M, Papamichael CM, Megas J, Souvatzoglou A, et al. Impaired endothelium-dependent vasodilatation in women with previous gestational diabetes. Diabetes Care 1998;21:2111-5. Freire CM, Barbosa FB, de Almeida MC, Miranda PA, Barbosa MM, Nogueira AI, et al. Previous gestational diabetes is independently associated with increased carotid intima-media thickness, similarly to metabolic syndrome-A case control study. Cardiovasc Diabetol 2012;11:59. Tarim E, Yigit F, Kilicdag E, Bagis T, Demircan S, Simsek E, et al. Early onset of subclinical atherosclerosis in women with gestational diabetes mellitus. Ultrasound Obstet Gynecol 2006;27:177-82. Volpe L, Cuccuru I, Lencioni C, Napoli V, Ghio A, Fotino C, et al. Early subclinical atherosclerosis in women with previous gestational diabetes mellitus. Diabetes Care 2008;31:e32. Bo S, Valpreda S, Menato G, Bardelli C, Botto C, Gambino R, et al. Should we consider gestational diabetes a vascular risk factor? Atherosclerosis 2007;194:e72-9. Li JW, He SY, Liu P, Luo L, Zhao L, Xiao YB. Association of Gestational Diabetes Mellitus (GDM) with subclinical atherosclerosis: A systemic review and meta-analysis. BMC Cardiovasc Disord 2014;14:132. Caliskan M, Caklili OT, Caliskan Z, Duran C, Ciftçi FC, Avci E, et al. Does gestational diabetes history increase epicardial fat and carotid intima media thickness? Echocardiography 2014;31:1182-7. 3 Is Uric Acid a Missing Link between Previous Gestational Diabetes Mellitus and the Development of Type 2 Diabetes at a Later Time of Life?